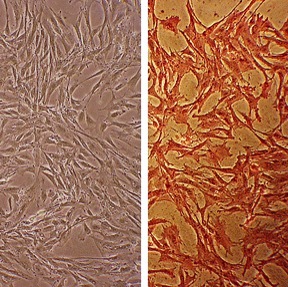 Bovine Aortic Smooth Muscle Cells (BAOSMC) provide an excellent model system to study all aspects of cardiovascular function and disease, especially those related to mechanisms of hyperplasia and hypertrophy of intimal smooth muscle cells leading to vascular occlusion in atherosclerosis and stent restenosis. (Click to Enlarge) Bovine Aortic Smooth Muscle Cells: BAOSMC. Isolated from the main artery of the body, supplying oxygenated blood to the circulatory system. Randall, T., S. Islam, I. Mahbub, N. McFarlane and Y. Yu. 2016. A low-power, reconfigurable, pipelined ADC for implantable bioimpedance measurement system with vertically aligned carbon nanofibers (VACNF) electrodes. Analog Integr Circ Sig Process, 89:139-149. Yu, Y. K. Al Mamun, A. Shanta, S. Islam, and N. McFarlane. 2016. Vertically Aligned Carbon Nanofibers as a Cell Impedance Sensor. IEEE Transactions on Nanotechnology, 10.1109/TNANO.2016.2558102. Mathura, R., S. Russell-Puleri, L. Cancel, and J. Tarbell. 2014. Hydraulic Conductivity of Endothelial Cell-Initiated Arterial Cocultures. Annals of Biomedical Engineering, 42:763-775. Slee, J. 2014. Elucidating the Anti-Inflammatory Roles of Heparin and Shear Stress in Atherosclerosis. PhD Dissertation, Lehigh U.
Kuribayashi-Shigetomi, K., H. Onoe, and S. Takeuchi. 2012. Cell origami: self-folding of three-dimensional cell-laden microstructures driven by cell traction force. PloS one. 7:e51085-e51085. Smela, E. and P. Abshire. 2012. Cell-based sensing: biological transduction of chemical stimuli to electrical signals (nose-on-a-chip). Patent US 8152992 B2. Dronadula, N., L. Du, R. Flynn, J. Buckler, J. Kho, Z. Jiang, S. Tanaka, and D. Dichek. 2011. Construction of a novel expression cassette for increasing transgene expression in vivo in endothelial cells of large blood vessels. Gene Therapy, 18:501-508. Patel, H., D. Silversmith, P. Abshire, and T. Datta. 2011. Nose on a Chip, MERIT BIEN 2011 Final Report. Dronadula, N., L. Du, R. Flynn, J. Buckler, J. Kho, Z. Jiang, S. Tanaka, and D.A. Dichek. 2010. Construction of a novel expression cassette for increasing transgene expression in vivo in endothelial cells of large blood vessels. Gene therapy. 18:501-508. Fan, L., J. Sakai, S. Bessho, S. Wada, and T. Karino. 2010. Effect of a disturbed flow on adhesion of monocytes to a model of an arterial wall. Biorheology. 47:15-29. Ohashi, T., N. Kameda, S. Nakamura, and M. Sato. 2010. Biomechanical Contribution of Cytoskeletal Structures to Traction Forces in Cultured Smooth Muscle Cells. J Biomechan Sci and Eng, 5:262:271. Nelson, N., D. Sander, M. Dandin, S.B. Prakash, A. Sarje, and P. Abshire. 2009. Handheld fluorometers for lab-on-a-chip applications. Biomedical Circuits and Systems, IEEE Transactions on. 3:97-107. Maier, K.G., B. Sadowitz, S. Cullen, X. Han, and V. Gahtan. 2009. Thrombospondin-1–induced vascular smooth muscle cell migration is dependent on the hyaluronic acid receptor CD44. Am J Surg, 198:664-669. Du, W. 2008. Mechanics of Aortic Smooth Muscle Cells in Three-dimensional Tissue Constructs. Washington University in St. Luis, PhD dissertation. Fan, L.J., and T. Karino. 2008. Effect of serum concentration on adhesion of monocytic THP-1 cells onto cultured EC monolayer and EC-SMC co-culture. Journal of Zhejiang University. Science. B. 9:623-629. Mathews, D.T., Y.A. Birney, P.A. Cahill, and G.B. McGuinness. 2008. Vascular cell viability on polyvinyl alcohol hydrogels modified with water-soluble and -insoluble chitosan. Journal of biomedical materials research. Part B. 84:531-540. Sakai, J., T. Karino, and K. Niwa. 2008. Flow-dependent accumulation of LDL in co-cultures of endothelial and smooth muscle cells in the presence of filtration flow through the cell layer. Clinical hemorheology and microcirculation. 38:245-256. Wang, X.-J., K. Maier, S. Fuse, A.I. Willis, E. Olson, S. Nesselroth, B.E. Sumpio, and V. Gahtan. 2008. Thrombospondin-1-induced migration is functionally dependent upon focal adhesion kinase. Vascular and endovascular surgery. 42:256-262. Yoneyama, T., K. Miyata, T. Chikai, A. Mikami, T. Suzuki, K. Hasegawa, T. Ikeda, T. Watanabe, T. Ohyama, and K. Niwa. 2008. Clostridium botulinum serotype D neurotoxin and toxin complex bind to bovine aortic endothelial cells via sialic acid. FEMS Immunology & Medical Microbiology. 54:290-298. Prakash, S.B., and P. Abshire. 2007. On-chip capacitance sensing for cell monitoring applications. Sensors J., IEEE. 7:440-447. Mathews, D.T. 2006. Characterisation of polyvinyl alcohol hydrogels modified with chitosan for cardiovascular applications. Dublin City University, PhD dissertation. Liu, Y., E. Smela, N.M. Nelson, and P. Abshire. 2004. Cell-lab on a chip: a CMOS-based microsystem for culturing and monitoring cells. In Engineering in Medicine and Biology Society, 2004. IEMBS'04. 26th Annual International Conference of the IEEE. Vol. 1. IEEE. 2534-2537. Niwa, K., T. Kado, J. Sakai, and T. Karino. 2004. The effects of a shear flow on the uptake of LDL and acetylated LDL by an EC monoculture and an EC–SMC coculture. Ann Biomed Eng. 32:537-543. Reeves, N., Y. Liu, N.M. Nelson, S. Malhotra, M. Loganathan, J.-M. Lauestein, C. Chaiyupatumpa, E. Smela, and P. Abshire. 2004. Integrated MEMS structures and CMOS circuits for bioelectronic interface with single cells. In Circuits and Systems, 2004. ISCAS'04. Proceedings of the 2004 International Symposium on. Vol. 3. IEEE. III-673-676 Vol. 673. Gudi, T., J.C. Chen, D.E. Casteel, T.M. Seasholtz, G.R. Boss, and R.B. Pilz. 2002. cGMP-dependent protein kinase inhibits serum-response element-dependent transcription by inhibiting rho activation and functions. J.Biol.Chem. 277:37382-37393. Sakr, S.W., R.J. Eddy, H. Barth, F. Wang, S. Greenberg, F.R. Maxfield, and I. Tabas. 2001. The uptake and degradation of matrix-bound lipoproteins by macrophages require an intact actin cytoskeleton, Rho family GTPases, and myosin ATPase activity. Journal of Biological Chemistry. 276:37649-37658. Stathakis, P., A.J. Lay, M. Fitzgerald, C. Schlieker, L.J. Matthias, and P.J. Hogg. 1999. Angiostatin formation involves disulfide bond reduction and proteolysis in kringle 5 of plasmin. Journal of Biological Chemistry. 274:8910-8916.4:8910-8916.